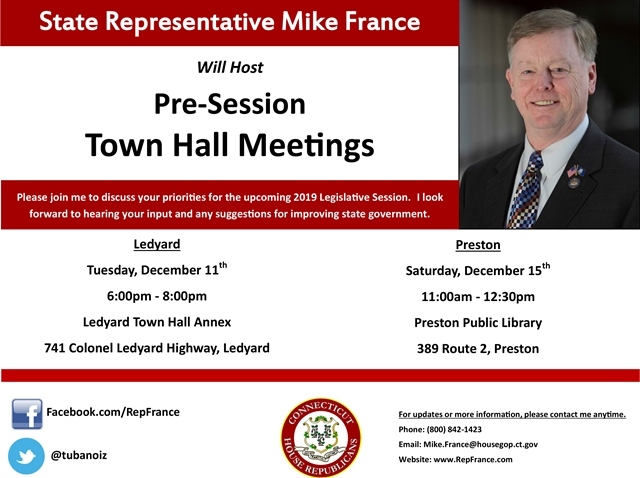 HARTFORD — State Representative Mike France (R-42) invites his constituents to join him for a town-hall style meeting at the Ledyard Town Hall Annex on December 11th for a Pre-Session discussion of legislative priorities and other issues of interest. On December 15th, he will be holding a second Pre-Session discussion at the Preston Public Library. Rep. France will be available to answer your questions concerning what’s happening up in Hartford, new laws that went into effect this fall, and proposed legislation for the upcoming 2019 Legislative Session. WHEN: Tuesday, December 11th from 6:00 p.m. to 8:00 p.m. WHEN: Saturday, December 15th from 11:00 a.m. to 12:30 p.m. These events are free and open to the public. If you are unable to attend but would still like to connect with Rep. France, please do not hesitate to contact him at Mike.France@housegop.ct.gov or (800) 842-1423. If either meeting needs to be cancelled or postponed, a notice will be posted on Rep. France’s website at www.RepFrance.com and his Facebook page at www.Facebook.com/RepFrance.